The first wave of "launch" copies of March 19th's $60 Gears of War: Judgment will come bundled with a bonus $19.99 "value", according to a Microsoft press release e-mailed this morning. A download code for the original Gears of War, which the company says "more than half" of the players of the last Gears game—Gears of War 3—didn't play. That late-2006 game launched for $60 and goes for $19.99 if you want to download it to your Xbox 360 now. It's nice to get a free game when buying another game, right? Even if there's a strong chance that nearly half the people buying this new game probably already played it. After all, that's as valid a way to interpret Microsoft's research stat as Microsoft's way, no? So what's a game that maybe nearly half of the Gears faithful already played really worth? Twenty bucks? Zero bucks (complete with an order for the $60 Judgment)? It's notable that Microsoft is even trying to sell the original five year old Gears for $20 these days. Who thinks that's a good price for a game that has enjoyed two iterative sequels and is about to get a third? On Steam, on PSN, games that old often go for far less. And over at GameStop, you can buy the original Gears of War, on a disc, for a scant.... $2.99. What a bargain! That's awesome. However it looks like the USA only gets 1600 MSP. Still an awesome deal. I've posted the full list of qualifying games HERE. OverRun Demo on it's way. Achievements and no Seriously this time around! Looks like an easy but time consuming 1000 to be fair, no more level 100 so i'm guessing the XP gaps up to Level 50 might be pretty big, Gears 2 style I hope! The Declassified Missions on Insane might take a while but if 4 of us get together I reckon they'll be a breeze. If you preorder Gears of War: Judgment at Walmart.com, you’ll not only get: Gears of War: Judgment for the Xbox 360, a bonus* Preorder Exclusive Classic Hammerburst and bonus Gears of War 1 downloadable version, you’ll also receive your choice of Gears of War 2 or Gears of War 3, for free! Gears of War: Judgment launches on March 19th in the US and a worldwide demo for Xbox Live Gold Subscribers will be available the same day. OXM Article - How People Can Fly turned Gears into a score attackers paradise. 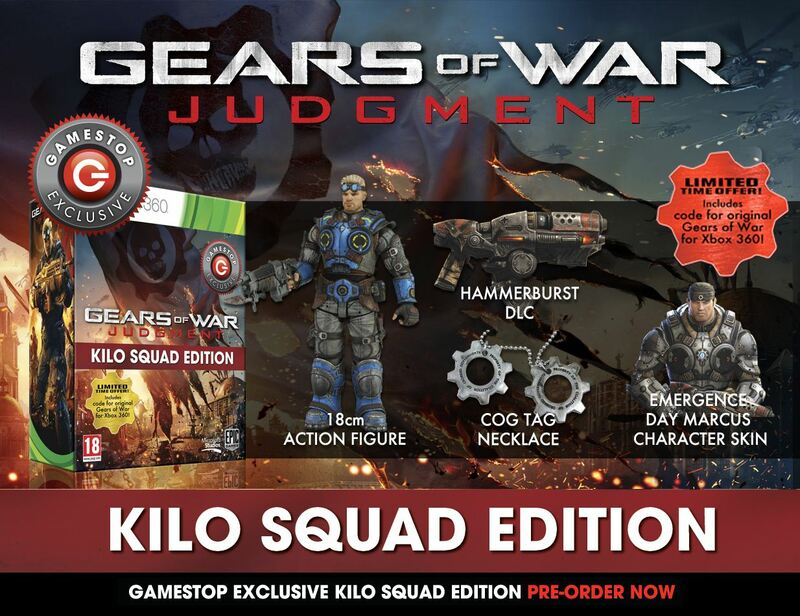 Exclusive to GameStop in the UK, Epic and Microsoft have unveiled the Gears of War: Judgment Kilo Squad Edition, which comes with all manner of collectible bits and bobs, including an 18cm Baird action figure and some DLC, including the Hammerburst and Young Marcus Fenix skin. The Gears of War: Judgment Kilo Squad Edition (pictured below) is available to pre-order exclusively at GameStop UK for £69.97. In North America, it appears that the Baird figure can be purchased separately at for $19.99, with a Lambent weapon skin and Young Marcus skin available with GameStop pre-orders. Power Up Rewards members can also get 3-day early access to the OverRun multiplayer mode with earned XP carrying over.